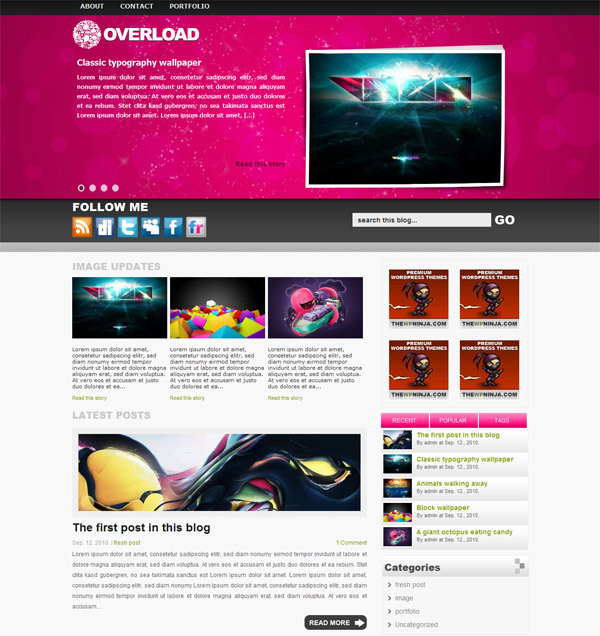 The Bloglab theme is the everyday bloggers’ secret weapon. The skinnable look and the user friendly content structure makes this theme a good choice for all bloggers who want to have a modern and stylish appearance. The theme has a built-in custom admin interface that lets you change almost everything in the theme. Enable or disable elements, change or disable content sliders and so on. No HTML knowledge is needed to customize the theme. With Bloglab you are getting two sidebar sizes. This means you can choose which one you want to use: 300 pixels wide widgets, or half sized widgets (142px wide). This let’s you customize your blog even more. And it has six different color styles that can be changed through the custom admin interface. All you need to do is choose a color style and save it. 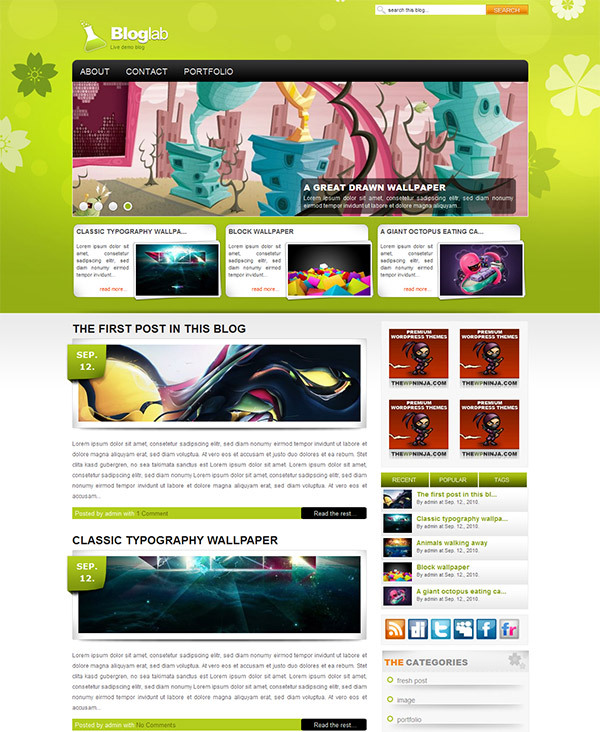 With the Bloglab Premium WordPress Theme you will get: A modern and unique design, 4 different skins, custom admin interface, complete installation and usage guide, built-in scripts, special script free menu, PSD logo source, single 300px wide sidebar widget space and two 140px wide sidebar widget space, built-in advertising options, content slider with post listing function and a Google Analytics ready code. 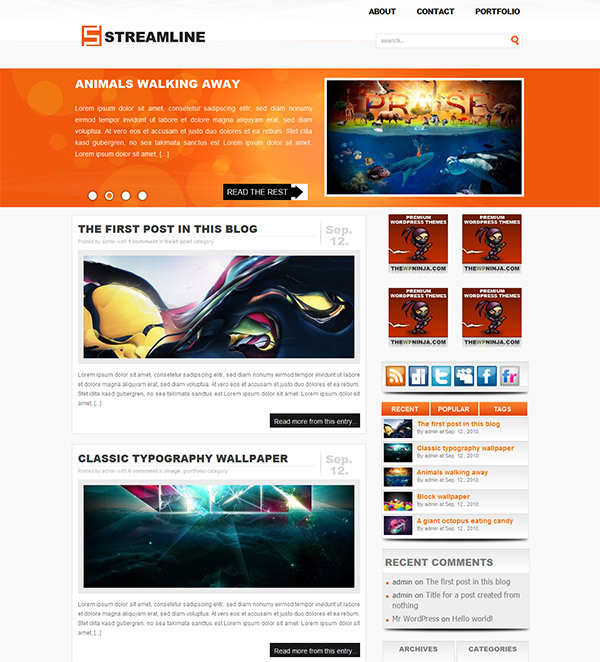 The Streamline theme is constructed of simple shapes, with a bit of WordPress magic. It has the perfect structure to blog about anything. The functions and the built-in scripts allow you to blog, advertise or sell your products. The customizable functions will help you create a unique website for your needs. The theme has a built in custom admin interface that lets you change almost everything in the theme. Enable or disable elements, change or disable content sliders and so on. No HTML knowledge is needed to customize the theme. The theme was created with two sidebar sizes. This means you can choose which one you want to use: 300 pixels wide widgets, or half sized widgets (142px wide). This let’s you customize your blog even more. You also get six different color styles that can be changed through the custom admin interface. All you need to do is choose a color style and save it. With the Streamline Premium WordPress Theme you will be getting: A modern and unique design, custom admin interface, complete installation and usage guide, built-in scripts, special script free menu, PSD logo source, single 300px wide sidebar widget space and two 140px wide sidebar widget space, built-in advertising options, content slider (can be disabled) with post listing function and a Google Analytics ready code.